Great Waters Press recently blessed us with two selections to review. 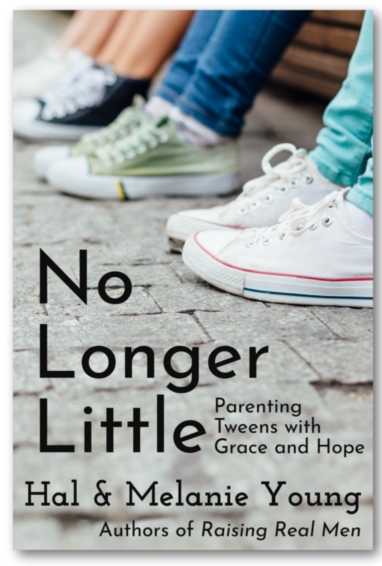 No Longer Little: Parenting Tweens with Grace and Hope is their newest title. This is geared for parents who have kids entering those tween and super early teen years, so about 8-14 range. 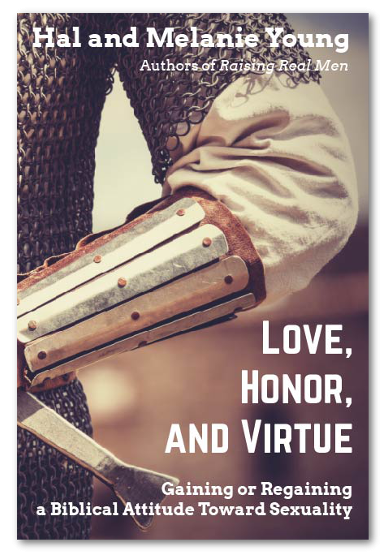 Love, Honor, and Virtue: Gaining or Regaining a Biblical Attitude Toward Sexuality is written to the boys who are 12-20s. This review will focus on No Longer Little: Parenting Tweens with Grace and Hope. Now....I always boast a truly unbiased review blog. It doesn't matter if I LOOOOOOOVE a company, if they send me a product that is less than I expect from them, I'll say so because I fully believe it is your right as a reader reading this blog to get the truth. With that said, when I receive books that signed it MAY sway me to the positive right off the bat HAHA! With that said, I am very appreciative that both Hal and Melanie Young took the time to sign my books. Thank you VERY much! I was first struck by the cover. WHO is able to keep white chucks that white?! I need that secret. This book is geared to the parents who are battling the tween/early teen years. Boy oh boy is this me right now! I thought the Terrible 3s were bad? HELLO TWEENDOM! 11 nearly killed me. 12 wasn't much better. 13...Oh I have high hopes for 13. This book seeks to lay a positive foundation for parenting NOW so that the teen years aren't so rough. They claim that most parent/child relationships are lost in this scary transitional phase. There's a lot going on here, physically and chemically, and it's a hard time on their bodies, minds, and spirits. I knew something was amiss with Mr. B when my normally lovey child was pushing me away, and being very short with me. He was never like that before. He was always the first to come running to me to give me a hug, or asking for "just one more kiss, mommy!" And I was always right there to oblige. But what happened? What happened when my sweet, loving boy hit 11? I would have swore he was suddenly possessed by demons. This child became mouthy, verbally aggressive, defiant, oppositional, and the list goes on and on and on. And my sweet nature style mothering flew out the window and I became the monster mom I said I'd never be. I hated it. I hated myself...to be honest. I was so lost, and navigating this territory alone is scary. Where...WHERE was this book 2 years ago?! "Don't let their emotional roller coaster be you own..." Quote from the book. LOVE THIS! This is probably my favorite line from the entire book. Why? Because this was my downfall. I would ALWAYS react to Mr. B. Whether positive or negative, I'd react. Every time. And that was EXACTLY what he wanted. And by reactive, even negatively and jumping on his roller coaster with him, I was inadvertently reinforcing all of this negative behavior. His doctor we saw 3 hours 1 way away kept telling me I needed to disengage from the situation, back away, and ignore certain things or go about them in a different way. Friends, I put THOUSANDS of miles on my car, spend hundreds of hours of my life I can never regain, to hear the same things from this doctor that I found in this book. Imagine the time and energy I would have saved had I known about this 2 years ago. And the book is so right. If you jump in there, too, you are reinforcing the negative tone and poor behavior that you want to change. WE are our child's biggest role-model, so if we react or act the same way, how can we expect different from them? Puberty is a beast. There...I said it. It's a beast. There's hormonal fluctuations, and changing interests, new clothes, and holy moly can those kids EAT! NO ONE told me that boys experienced mood swings! NO ONE! I used to joke and say at least I didn't have to deal with moody PMS. HA! WHATEVER! Let me tell you right now, this boy of mine can out PMS any girl! And you know what else? He has these mood swings EVERY month, like clockwork! Did you know boys would do that?! I didn't! These are things they should tell you when you give birth. Really. But they don't, and that's where No Longer Little: Parenting Tweens with Grace and Hope saves the day. As I read the pages I found myself nodding in agreement, and wiping away tears. They get it. They have been there, battled that, and survived to write the book I needed years ago. This book points out all the different ways your child is changing during this critical stage of development, and it teaches you how to recognize what is going on, when, and what you can do to cultivate positive change in the face of uncertainty. I appreciate how this book offers up the reasoning behind the behavior. It's a self-help kind of book, but it shows you why the suggestions work. And they do work...I've seen first hand. Just this week Mr. B has been more compliant, less mouthy, and much more open to discussion rather than shutting me out. It has been a very, very good week. And it's actually been a very, very good 3 weeks. Overall, I wish I had had this book YEARS ago! I think this should be a standard gift for any baby shower and new parent. And I think it should be read earlier than the tween years so you are well prepared to fight the battle of change with grace and the knowledge that you are not alone. Overall, I really appreciate the information in both of these books. I like how it's like reading a conversation from a friend, and it's not judgmental at all. They are truly helpful, and I've gained valuable insight from both!